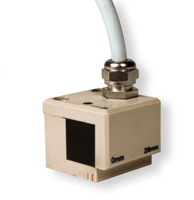 The OmniScan® ECA test configuration supports 32 sensor coils (up to 64 with an external multiplexer) working in bridge or transmit-receive mode. The operating frequency ranges from 20 Hz to 6 MHz with the option of using multiple frequencies in the same acquisition. Covers a large area in a single pass. Reduces the complexity of mechanical and robotic scanning systems. Provides real-time cartography of the inspected region, facilitating data interpretation. Is well suited to complex part geometry. Improves reliability and probability of detection (POD). 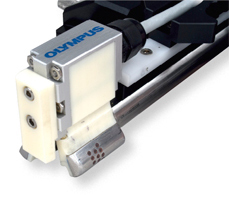 Olympus manufactures ECA probes for a wide range of applications. 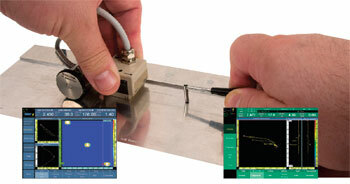 Probes can be designed to detect a specific type of flaw or to follow the shape of the part being inspected. Standard designs are available to detect defects such as cracks and pitting, and subsurface defects such as cracks in multilayer structures, as well as corrosion. Multiplexing principle between elements. Coils are shown for illustration purposes only. Eddy current array probes can replace one axis of a two-axis scan and offer greater flexibility in the eddy current setup. Probes can be made in different shapes and sizes to follow, with ease, the contour of the part under inspection. All the channels of a group are calibrated simultaneously, each channel having its own gain and rotation. Amplitude and phase can be set on different reference flaws. Three alarm outputs can combine LED, buzzer, and TTL output. Various alarm zone shapes can be defined in the impedance plane (sectorial, rectangular, ring, etc.). 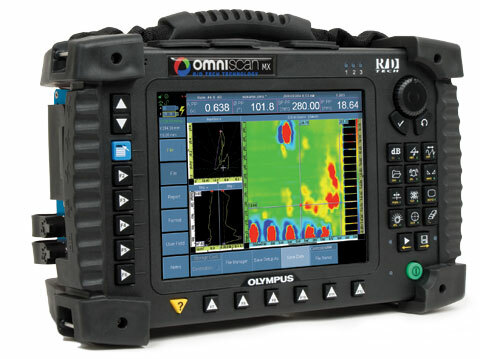 C-scan parameters and multiplexing sequence are automatically set when the probe is connected. This function can be used to remove the lift-off variation that is shown between adjacent channels. When working with two frequencies, a MIX signal can be generated to remove unwanted signals (for example, lift-off, fastener signals, etc.). Several filters can be applied to the data such as high-pass, low-pass, median, and averaging filters. The illustrations below represent an application where cracks are located at the edge of a lap-joint which has a sharp thickness variation. The filtered data may improve detection, especially for small cracks.